Real-time 2-way messaging platform that works with all corporate and bank systems. Manage all corporate, payment interfaces and data formats from a single environment. Pay to any payment type including bank account, cash, check, card, e-wallet or crypto. Advanced security, super high performance and GDPR compliant. Private blockchain supports rich data for reconciliation and auditing with smart contract-powered permissions so parties only access the data they are authorized to see. Rich data can be appended to payments to facilitate reconciliation. Make payments via an easy to use API or intuitive UI, all configurable to your needs. 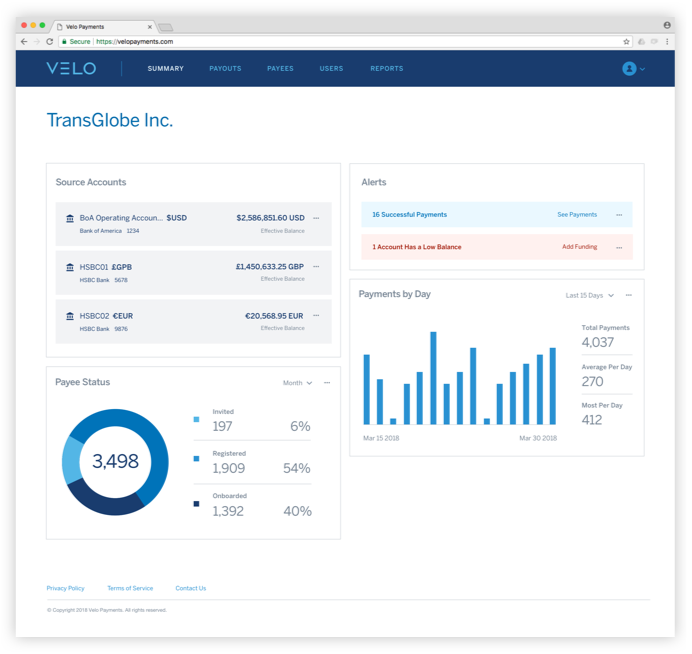 Real-time analytics with in-state tracking of your payments. 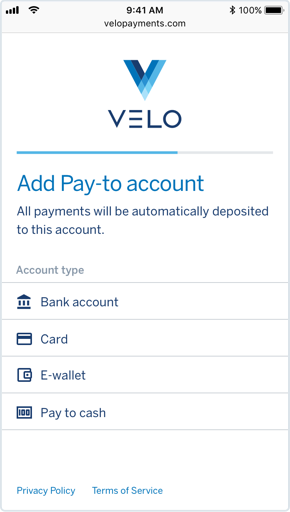 Velo has moved the burden of payee on-boarding from you to your payee and offers new payment types to expand your addressable payees to include the unbanked and underbanked. Real-time tracking and alerts allow your payees to self-help, reducing customer support. Capture compliance with the option to add social and other dynamic data sets. Pay to bank, e-wallet, card, check, cash or even crypto across any currency or portion of funds. Elliptical curve encryption and 2FA secures all messaging and endpoint access. 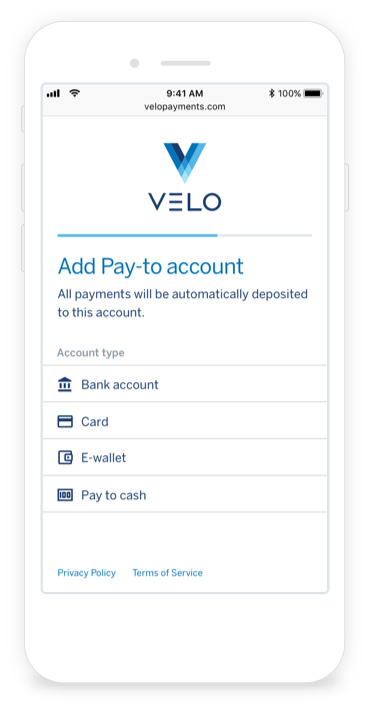 VeloNet allows payment delivery to any bank and non-bank payment types. Disburse payments to any currency or payment type including e-wallet, cards or virtual. Plug your funding bank accounts into the VeloNet gateway for total control of funds flow. Bank partners can license Velo and service you directly. Most Velo benefits are available via a flat fee including domestic payments. For enterprises, cross border payments are a fraction of typical fee structures. Payments can be made to more payment channels including e-wallets, cash, card and cryptocurrencies to expand your payee audience.